Butler went 1-2 over the weekend. Jimmy Lafakis/Collegian file photo. The Butler softball team moved to 7-10 on the season after a 1-2 showing at the Saluki Invitational at Southern Illinois University. The weekend was highlighted by freshman pitcher Karli Ricketts’ one-hit performance in an 11-0 win over Green Bay. The Bulldogs were originally scheduled to play five games in Carbondale, but rain washed out their March 9 games against Miami Ohio and Iowa. To open the weekend, the Bulldogs squandered a solid complete game five-hit performance from pitcher Alyssa Graves against Illinois-Chicago. Up, 2-1, the Bulldogs were three outs away from securing the win, but two errors in the top of the seventh allowed the Flames to rally and win 3-2. In the third inning, Ricketts hit her first collegiate home run on a shot to center field to put Butler ahead 1-0. Sammy Andersen had the other RBI for the Bulldogs on a single into left field. In their lone win of the Saluki Invitational, the Bulldogs combined stellar pitching from Ricketts and an explosive offense to beat Green Bay 11-0 in five innings. The Bulldogs led just 1-0 before posting 10 runs in the fourth and fifth innings. In the fourth inning, the Bulldogs loaded the bases on a fielder’s choice and a pair of walks and Kaitlin Doud hit her first home run of the season on a grand slam to center field. They loaded the bases again in the fifth, this time with no outs, and finished out the Phoenix with six runs off six hits. Butler’s eight hits came from eight different players. Rickets threw five shutout innings and allowed one hit while striking out five batters. To close the weekend, the Bulldogs were routed by host Southern Illinois in five innings. Saluki pitcher Brianna Jones threw her second perfect game of the season in a 16-0 win over Butler. 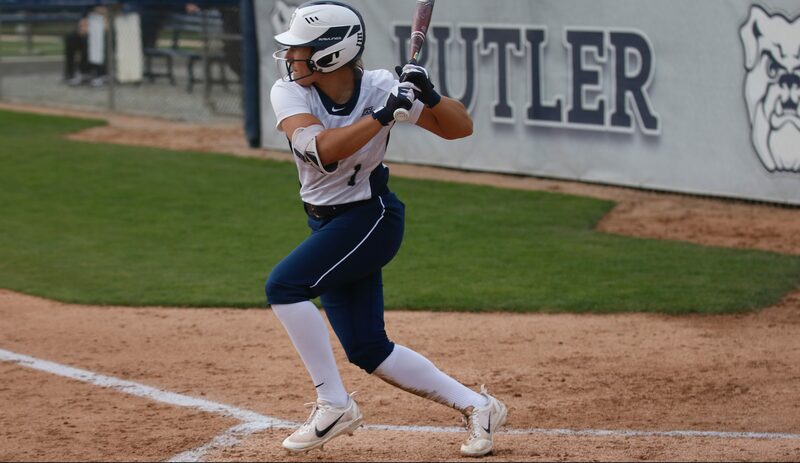 All five of Butler’s pitchers saw action in the loss, including Dani Deuschle’s first appearance in a Bulldog uniform. The Bulldogs gave up 12 hits. Butler will continue their spring break trip with a trio of midweek games against Army, twice, and North Dakota State March 12 and 13. Their next weekend will be at the USF Series at Southern Florida.